The sanctuary around the beautiful Pakhal Lake lies about 60 km from Warangal. A guesthouse run by the Forest Department is located on the shores of the lake surrounded by wooded hills. Moonlit nights are a heavenly experience. 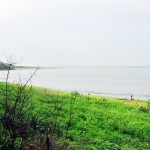 The lake itself was excavated in the 13th century. The sanctuary is home to the tiger, leopard, panthar and Sambhar, apart from a large number of migratory birds that arrive in winter. The Forest Department has put up ‘machine’ in the sanctuary, which affords a good view of the scenery around. Rail: The nearest railhead is Warangal, 130 km from Hyderabad and the best time to visit the area is between November and June. This entry was posted in Andhra Pradesh, Pakhal Lake. Bookmark the permalink.